In the first half both teams were fighting tooth and nail in desperation to get on the scoreboard. Tupapa Maraerenga Campbell Best scored the first goal of the match in the 18th minute to lead 1-0. In the 22nd minute Samuel Koiatu managed to equalise for his team Nikao Sokattak with a score of 1 all. Both teams continued their bombarding attacks at the opposition’s goal mouth. With both teams defence working hard to keep their opponents at bay. Nikao Sokattak’s Cajun Willis found the opening and scored Nikao’s second goal of the match in the 42nd minute of play to lead 2-1. The first half ended with 2-1 in favour of the home team Nikao Sokattak. The end to end action continued in the second spell with both teams pushing hard to score. Tupapa Maraerenga fought back hard but were unable to get past the Nikao Sokattak defence. Nikao spurred by the home support maintained their tireless effort and were rewarded with a two goals to one win. 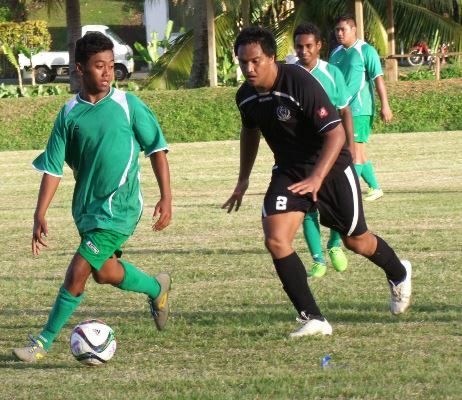 In the other Van’s Premier men’s matches on Saturday, Takuvaine beat Avatiu four goals to one. On Friday Puaikura beat Titikaveka one goal to nil. In the Islander Hotel Senior Women’s matches on Saturday, Nikao Sokattak and Tupapa ended their match with a nil all. Hard fought matches by Takuvaine vs Avatiu and Puaikura vs Titikaveka all ended in a nil all. At the CIFA complex in Matavera, CIFA Under16 Academy girls defeated Matavera three goals to two.